How do you hydrate yourself? Well, it’s still rainy season now. Summer hasn't arrived yet, but it is already hot. There were extremely hot days with temperatures exceeding 30 (86) degrees this month. It's getting hotter and hotter every year. Maybe because my metabolism is fast, I sweat a lot, so effective replenishing water, salt and mineral lost by sweating is important to prevent heat stroke. Drinking water or tea isn’t the effective means of prevention any more, and during the hot summer months, isotonic drink has been essential for me for the last few years. However, the drink has a demerit: it contains a lot of sugar. Though some companies produce low-cal ones, but few shops sell them (why?). 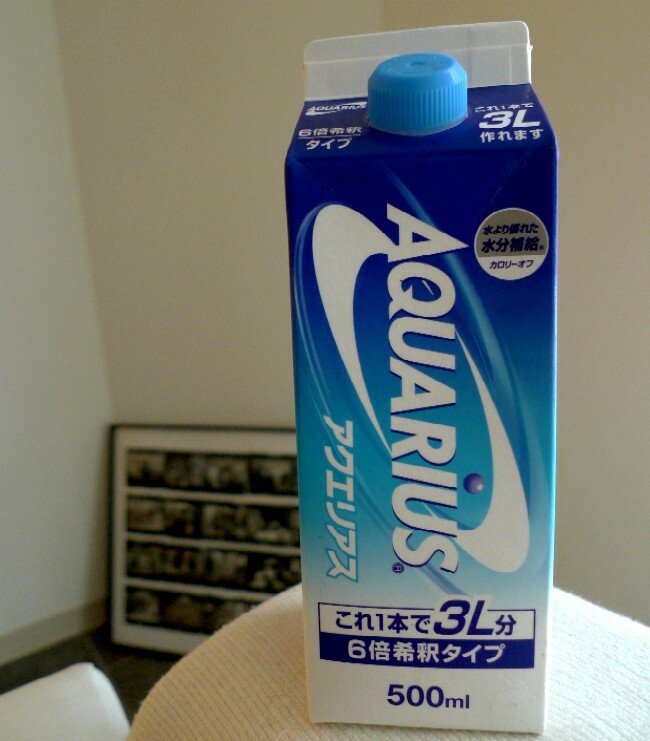 Until last year, I diluted regular isotonic drink with water, then drunk. From this year, I use concentrated one (sextuple strength). It isn’t a cool life to drink sloppy diluted sport drink day in, day out, for the functionality, but I never mind that. I feel the weather is life threatening. I hardly ever buy an item featuring a cat. 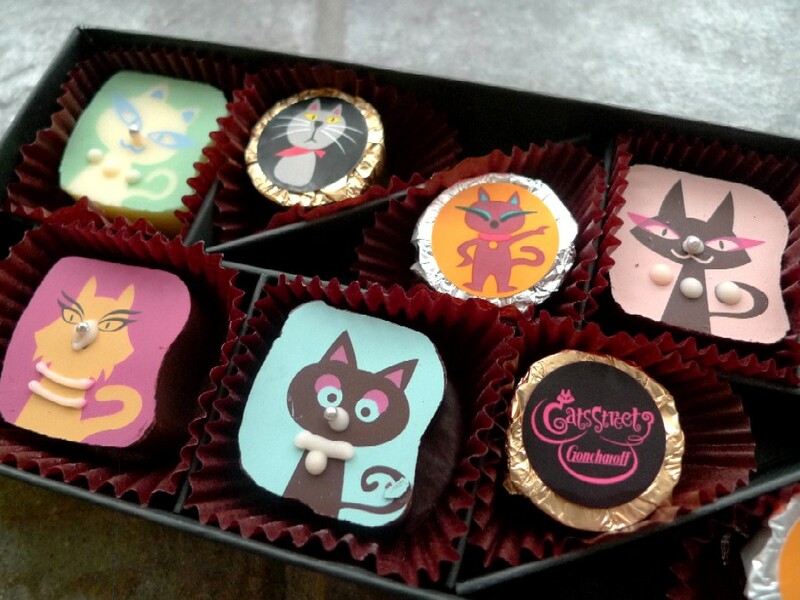 However, people sometimes give me cat items because they know I love cats and keep one. The box of chocolate in the photo is one of those presents my friend picked up for me. Fortunately or unfortunately, when she thinks of Kinakinw, she imagines cats. Even so, I liked it. Kawaii!Kawaii, a Japanese adjective, means adorable, cute or pretty. Each cat has a name. According to a little leaflet in the box, a cat on blue background is Jack who is gentle and nicey-nice boy. A cat on light pink background is Catherine who is the darling of the town and Jack’s girlfriend. I don't know a thing about the musical "Cats", but I know it’s a Cats-inspired story. I got it more than three months ago, and it’s still in the fridge because it's too nice to eat. I know it wouldn’t taste better if I age it, though. I think it's about time to eat Jack, Catherine, Charlie, Vivian, Brian, Bob and Kevin. 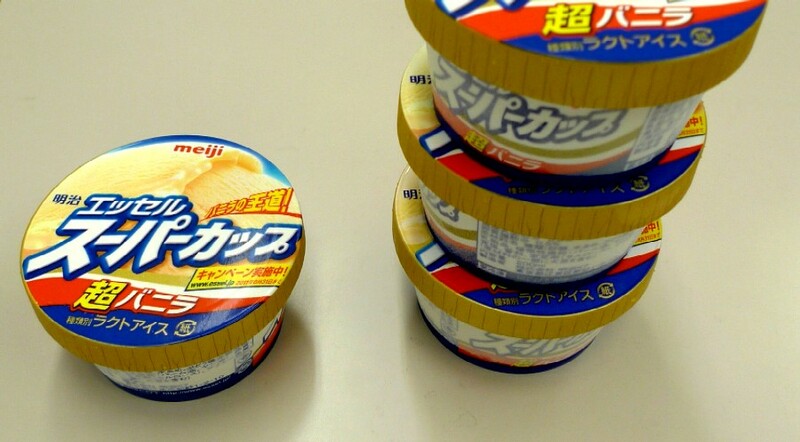 Which do you think is the biggest ice cream container? The left one appear larger than the others for me though they are the same in size. This misperception is called visual illusion in psychological terms. This is one of famous one called the Müller-Lyer illusion. 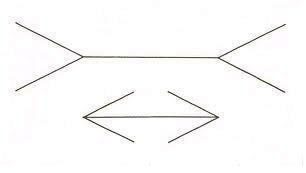 The two straight lines is the same in length. Actually, we experience this kind of phenomena every day. One professor found “the container illusion” in the opening photo at a convenience store the other day, and he got excited and duplicated it yesterday. In general, it’s said that the illusion occurs due to information processing in our brain. However, despite a pile of studies about this well-known phenomenon by many researchers and scholars, it’s still not fully understood why the misperception occurs to humans. It is certain that man is a confusing being. My mind jumps from the illusion to someone under an intolerably-bad illusion now. Unfortunately, we’re going through troubled times in the country under that person. Tokyo is in the middle of rainy season. I’ve been busy every day getting ready for an experiment. It’s currently my little fun to see hydrangeas blooming beautifully on street corners on the way to and back from laboratory. 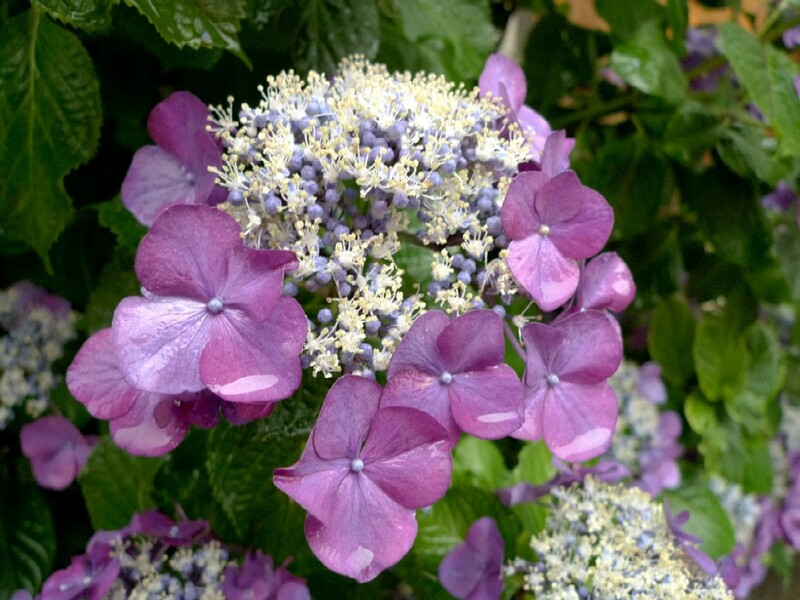 Hydrangeas blossom in all their beauty, and the following year they will bloom again, their lives continuing year by year. I’m deeply impressed with this kind of nature as I get older, and I'm glad to feel like that. I couldn’t update a blog often recently. It's not to say that I don’t have time, but I don't feel so much like writing an organized article now. When I have free time, I watch a movie or surf websites in an absent-minded way. So, for a while, I’d like to try to post lighter entries, which is like photo blog, more frequently. I saw the movie, “Ocean's Eleven”, last night. No, not that one, but the original one. 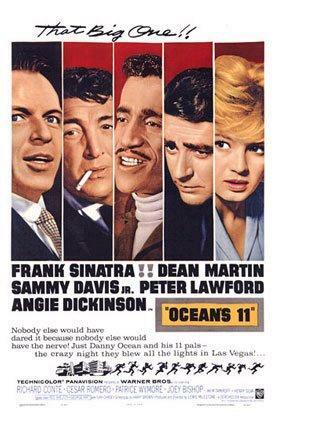 The 1960 Oceans’s is directed by Lewis Milestone and starring members of Sinatra family: Frank Sinatra as Danny Ocean, Dean Martin as Sam Harmon, Sammy Davis, Jr. as Josh Howard, Peter Lawford as Jimmy Foster, and Joey Bishop as Mushy O'Connors. In the movie, the eleven boys, ex-World War II 82nd Airborne veterans, rob five different Las Vegas casinos on a single night. I’m going to visit Las Vegas next month, and it was little preparation for one show I’ll see. I went there twice and saw several shows. I did enjoy Cirque du Soleil, Criss Angel, and others, but somehow, I felt short on fun when I left the town. Now, I clearly know why. 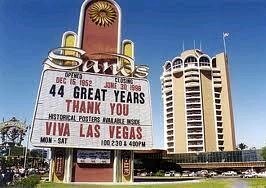 An image of Las Vegas I had in my childhood was nostalgic Vegas where Sinatra, Tony Bennett, and Elvis performed. 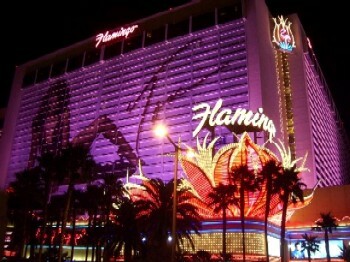 Yes, it’s dream Las Vegas of my parent's generation, but I want to relive the feeling of good old entertainments. I mean it’s like old style nightclub show where entertainers sing and dance on the stage with live band and people dress up and enjoy the stage with cocktails. The shows in big halls, like Celine Dion and Barry Manilow, are different from what I want in this case. Unfortunately, most of the stars are above, so I despaired of ever reliving that entertainments with straightforward approach. 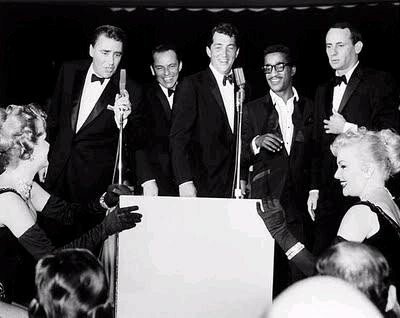 But, I explored ongoing shows this time (In the past, I did everything in a haphazard way in Vegas), and after such a long time, I noticed there are Rat Pack tribute shows. 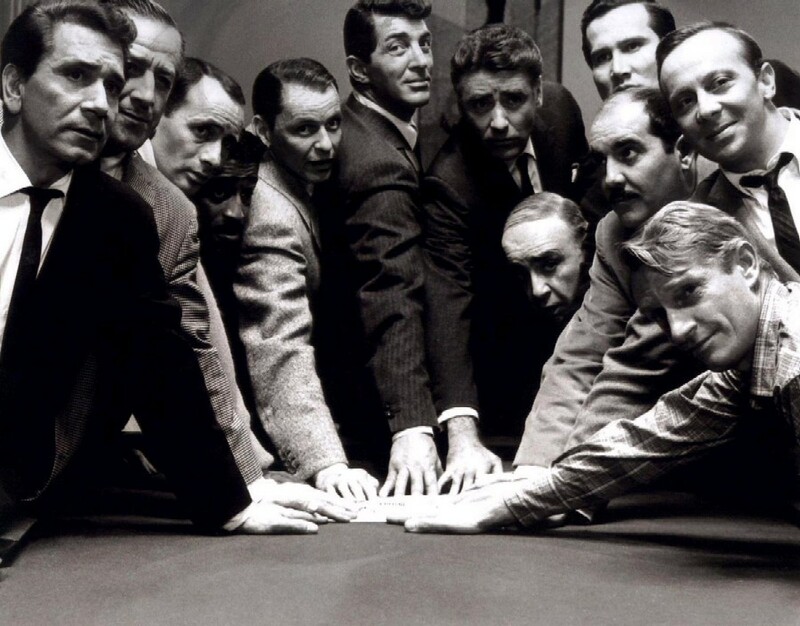 I’m going to see one of Rat Pack in Riviera, which re-enacts the performance of Sinatra, Dean Martin, Sammy Davis, Jr., and Joey Bishop in the Copa Room of Sands. 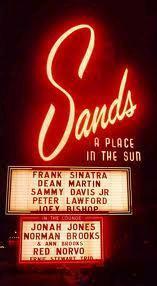 In the movie, Sands, Desert Inn, Sahara, Riviera, and The Flamingo are robbed. They were top hotels in Strip at the time. 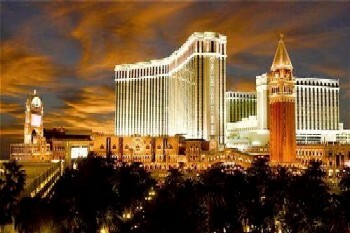 As time past, Sands (1988 - 1996) were reborn as Venetian. 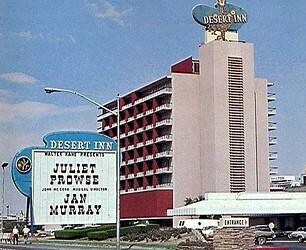 Desert Inn was purchased by Steve Wynn in 2000 and demolished. 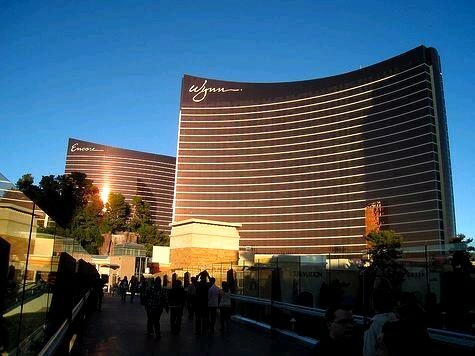 Wynn and Encore are in the location. 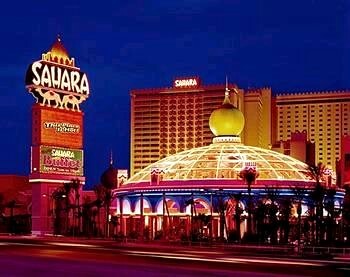 Sahara shut its doors on May 16, 2011. 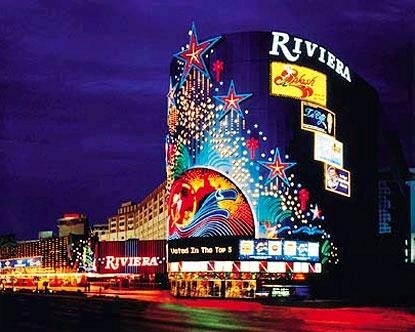 Riviera and Flamingo were rebuilt and expanded, and sill there. Lastly, I give my little impressions of Ocean’s. It’s enjoyable, of course, but the story slowly unfolds relative to the modern one, and many unneeded scenes makes it plodding. The casts in the modern one are uniformly handsome relative to the old one. Anyway, both are entertainment films with an all-star cast. If so, I declare the original the winner. I prefer watching versatile entertainers performing lavishly rather than just watching good-looking guys. That's how I feel. I took time off today and had lunch with my friends from high school at a French restaurant, Les Rosiers Eguzkilore, in new annex of Mitsukoshi department store in Ginza. This hot restaurant opened last September when the store renovated and launched the annex. Its HP says the 30-year old female chef, Andrée Rosiers, got Meilleur Ouvrier de France (Best Craftsman of France) and runs a restaurant of the same name in Biarritz, France. 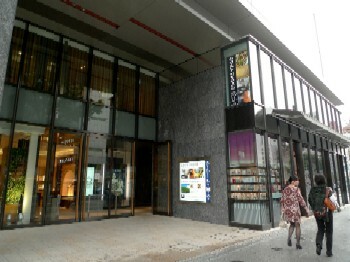 The one in Ginza may be the first overseas branch. Les Rosiers Eguzkilore is on the top floor of the annex. We had Mune déjeuner (\3,600 without 10% service charge), a two-course prix-fixe meal that is the most moderate price menu provided only during lunchtime. 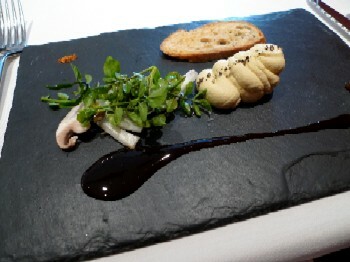 I chose foie gras mousse for appetizer and beef filet for entrée. 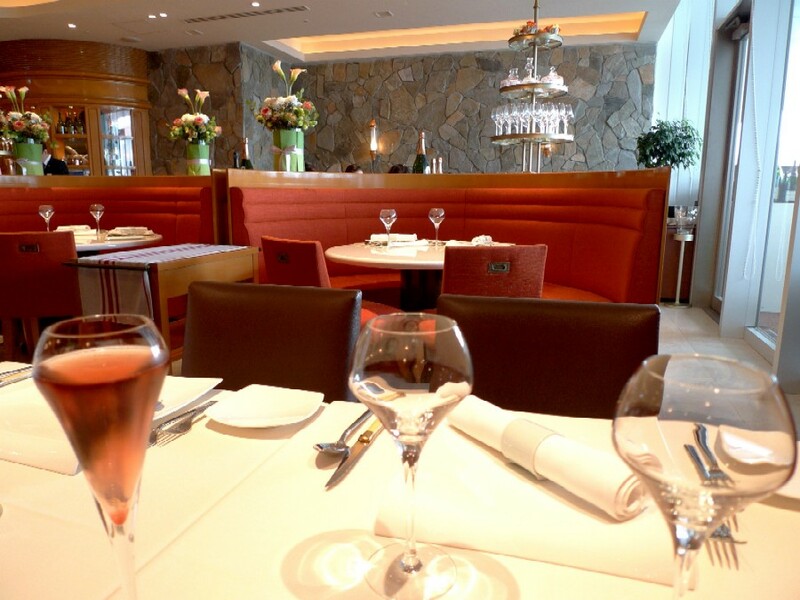 The restaurant calls their cuisine modern French. 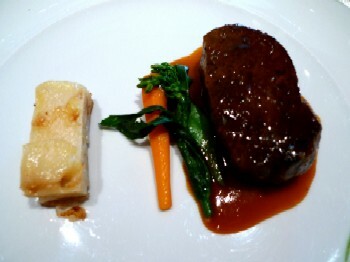 Indeed, the dishes were more natural and lighter than so-called "nouvelle cuisine", and I understood it’s their modern. I liked them and also interior decorating. 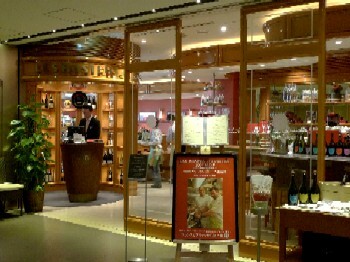 I drank a kir royale and a glass of red wine, and I paid about \7,000 for the lunch. I think the cost was proper. To be honest, however, I could make more meaningful use of the money for lunch. Anyway, the friends and I went to same private girls' school and spent a great deal of time together. We passed in and out of our home, traveled, stayed out on the town late at night, and had dinner until we were in mid-twenties. Today, we met each other for the first time in 10 years. Now, one of them is a manager of a large corporation, and some are well-off housewives. But after half an hour, we felt like going back to our teenage days and engaged in lively talk. Once we peel away the outer layer, we are exactly the same as before. 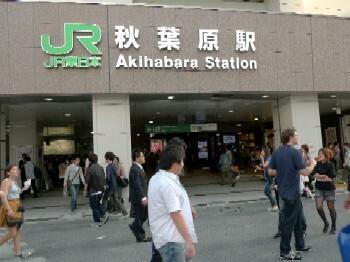 I stopped by Akiba (an abbreviation for Akihabara) on my way home in order to get an usb to serial converter cable. 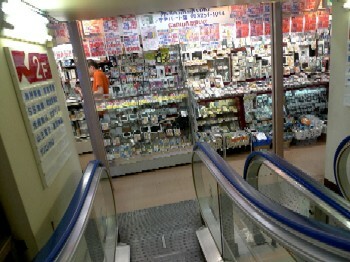 Every time I go to Akiba, I hang around too long because I visit stores to shop around PC, PC-related goods and cameras. Today I almost bought an ultraslim mini laptop on impulse by a hair. 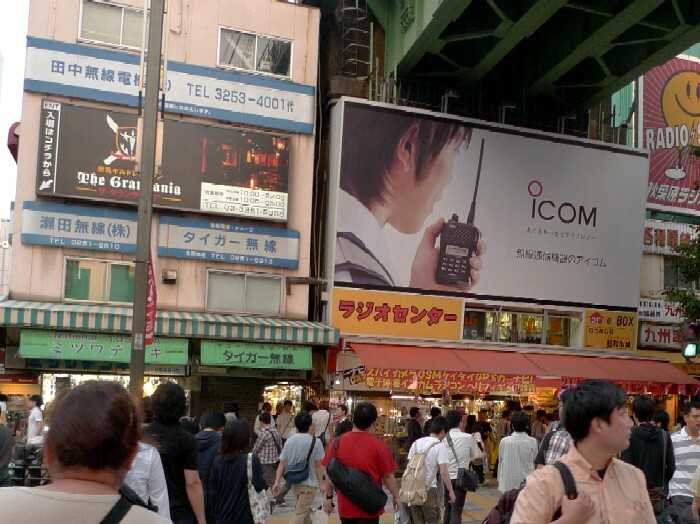 Akihabara is being redeveloped and reborn as a modern city, but I prefer sections that show signs of the post-World War II era. 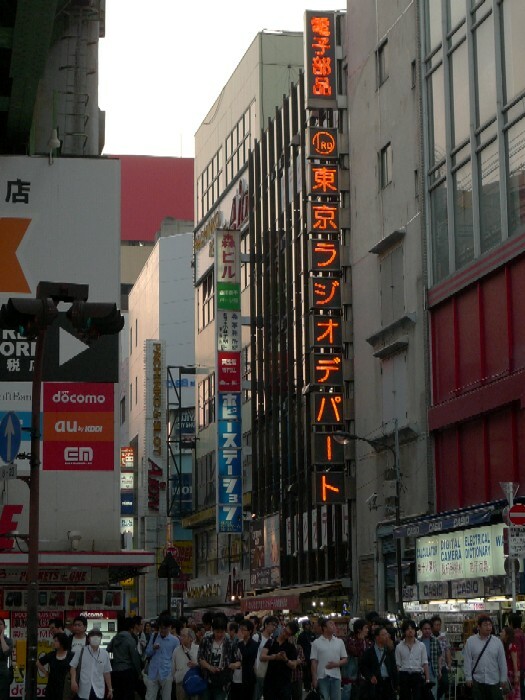 Typical places are Akihabara Radio Center and Tokyo Radio Department with a history of over 60 years. 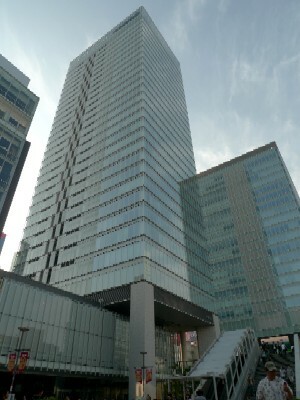 While the former is under the elevated shopping center, the latter is a multitenant building. 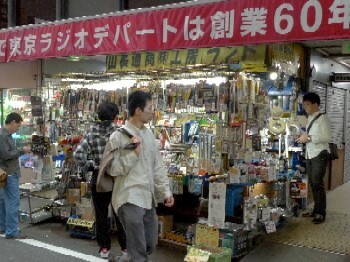 There are many small electrical stores selling radio goods and electrical items. It’s always fun for me to have a look around shops that are crammed with unidentifiable parts and people who closely examine those parts. I used to make frequent trips to Radio Center and Radio Department for electrical items. At one time, I conducted experiments for which original electrical devices were needed. I am electrically challenged, so I wisely thought there is no doing a soldering iron work. I decided to combine off-the-shelf items and make the devices having necessary functions. Most clerks kindly consulted me for advice on my self-willed problem, but I couldn’t easily get detailed information with which I could act at once because I couldn’t fully understand what they said…. They soon learned I was a nontechie. One old storeowner said, after casting about for ideas, “If you want my further advice, study electronics and come back.” I really thank you for their troubles. Did I make the devices in the end? No. I gave up making them by myself as hopeless, and I found another way to do it with PC and developed a simple computer program instead of physical devices.